The national office of Boy Scouts of America recently released the results of its survey of leaders of the top 10 faith-based charter organizations. 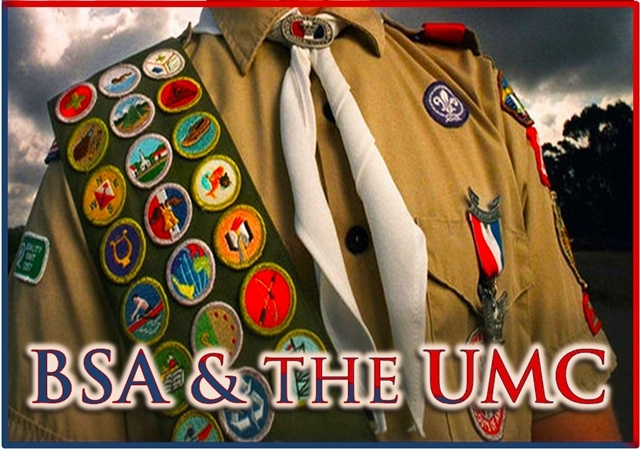 The national survey found 64.9 percent of United Methodist congregations would actively encourage other churches and organizations to charter scouting units; 20.5 percent were passive supporters and 14.6 percent said they would not recommend charting a unit of the Boy Scouts. The nearly 65 percent Net Promoter Score posted by the UMC is close to double that of the national average, which came in at 36.6 percent who would actively encourage other orgs to charter scout troops. A total of 1,144 leaders of Scout units in United Methodist Churches and UM leaders responded to Voice of the Scout Surveys conducted in March and October, 2014. “The Voice of the Scout Survey demonstrated some important information about the UMC’s relationship with the BSA,” said Larry Coppock, national director of UM Scouting Ministries. “The UMC continues to be a vital chartered partner, in serving youth in our church communities, including effective outreach." The national office of the Boy Scouts also wanted to find which drivers had the largest influence on the likelihood to recommend chartering a Scout unit. More than 86 percent of United Methodist leaders agreed with the survey statement “My organization sponsors units because scouting builds tomorrow’s leaders and citizens.” That figure is slightly higher than the 82.4 percent national average. More than 86 percent also agreed that scouting provides “positive youth programs” compared to 84.8 percent of the national average, and 74.4 percent agreed scouting is “a great value for the money” (68.1 percent of other faith-based organizations agreed). While 72.9 percent of United Methodists agreed “Scouting is our partner in providing positive youth programs to meet the goals of my organization,” that figure was slightly lower than the national average of 74.3 percent. Only 48 percent of United Methodists said they are satisfied with interactions between the church and Scout councils. The national average of 52.9 percent was slightly higher. “We do need to improve our lower scores for more effective communication and building stronger relationships with local BSA councils,” said Coppock. UM leaders also expressed some disappointment in the involvement of Scout families. Only 47.2 percent gave positive ratings to that category, compared to 53.9 percent of all faith-based charter organizations. **This story was adapted from an original post on the United Methodist Men website. Visit gcumm.org/news to view the original article.